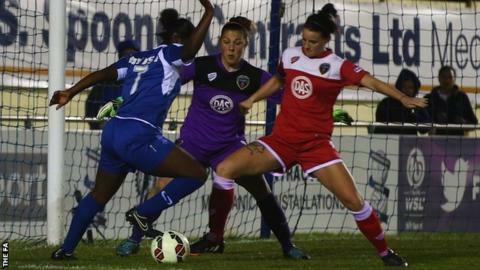 Bristol Academy earned their first point of the Women's Super League season as they held Birmingham City to a goalless draw at Solihull Moors. With new manager Willie Kirk watching from the stands, Bristol frustrated the hosts, who created far more chances but could not beat goalkeeper Mary Earps. The England Under-23 stopper blocked Karen Carney and Freda Ayisi's efforts. The result leaves Bristol bottom of the league, while Birmingham have now gone four home league games without scoring. Both Birmingham City and Bristol Academy remain without a league win so far in 2015. In a first half of few chances, the hosts came closest to opening the scoring but Birmingham's Melissa Lawley dragged her low shot narrowly wide. After the break, Lawley went close again but her shot was saved by Earps, who then denied substitute Carney from a narrow angle after Jade Moore's through ball, before Kirsty Linnett blasted over from close range. Substitute Sharla Passariello wasted the visitors' best effort, volleying over from outside the area, before Carney failed to fully connect with a Lawley cross late on, in what was the clearest opportunity of the match. "It was a fantastic performance by the girls. We created chance after chance, and opportunities in abundance. "We just haven't been able to find the back of the net. "It wasn't to be tonight, for whatever reason. Bristol didn't cause us any problems, especially in the second half. I just can't fault the girls." "The whole team has shown a lot of real character and spirit. "If they show that for the rest of the season, they'll be fine. "There's not much confidence in the camp but that will come." Birmingham City: Spencer, Sargeant, Carter, Mannion, Harrop, Ayisi, Allen, Potter, Moore (capt), Lawley, Windell. Substitutes: Baggaley, Linnett, Carney, Stringer, Westwood, Torkildsen, Haines. Bristol Academy: Earps, Dykes, Matthews, McCatty (capt), Brown, James, Ladd, Evans, Ingle, Watts, Murray. Substitutes: Evans, Bird, Passariello, Dalton, Hurst, Lawrence.